For many young college students football is a popular feature at many schools. In fact, going to the games can be a big part of student life. The college players themselves have to work very hard, both in academics and for the game. But to them it’s all worth it because football is something they love to do, and sometimes they even hope for it to be a part of their future. That’s how one player from Georgetown University had felt about the game. Ty Williams had been a promising athlete, and his coaches all saw a bright future ahead for him in the sport. But that all changed when one game did not end in Ty’s favor. 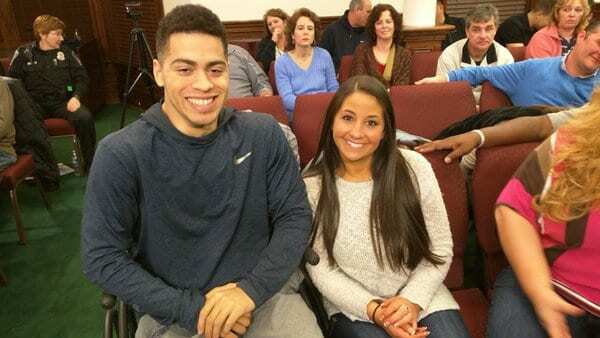 During a game in 2015, a routine tackle went wrong, and the injury that resulted effectively ended his football career and drastically affected his daily life. But Ty wasn’t going to give up on having a normal life. He soon showed everyone around him that he had an unbreakable spirit, and it didn’t take long before everyone around him was swept up by that positivity. When the day of Ty’s graduation finally arrived, no one could believe their eyes when they saw what Ty could do. It was a truly inspiring moment that is sure to bring a smile to your face. 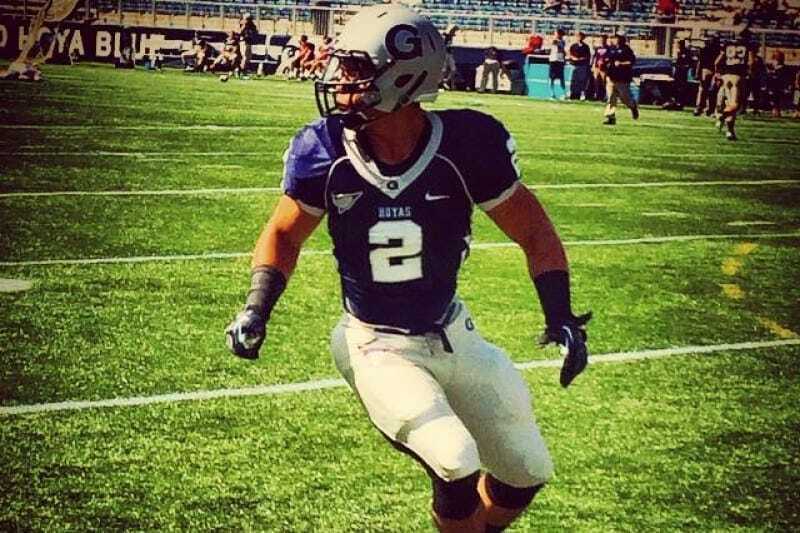 Ty Williams was a student at Georgetown University, and was one of their football team’s star linebackers. He grew up nearby in Montgomery County, Maryland where he had spent his high school years playing football at Quince Orchard High School. He seemed like a promising student and athlete, with a bright future ahead of him in his football career. Coaches couldn’t say enough praising his skill and how far he could go. But at age 21 as he started a new school year, a new season of football began that would end up changing the course of his life. 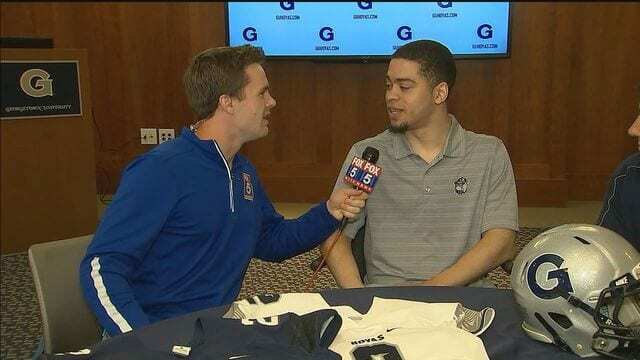 Ty loved playing on his team, the Hoyas, and he couldn’t wait to get the season started. In September their game for the opening of the football season was going to be in Pennsylvania where they would be playing Saint Francis University. So the team got on a bus and headed out. It may not be the most important game of the year, but the first game of the season can set the tone for the rest of your year, so Ty was ready to give it his all. The game seemed to be going well and it was just like any college football game. Fans were excited to have the season start and were in the stands cheering. But during the game when Ty went to get a pass, with the goal of scoring a first down, a player from Saint Francis University tackled him. At first it looked like a normal tackle, but in reality it had gone very wrong. Even the crowd called out a collective “oooh” as Ty laid on the field unmoving. Ty later recalled that it felt like everything was tingling and he couldn’t totally feel his legs. During the tackle his neck had recoiled, and the impact of the whole thing ended up fracturing his vertebrae. The doctors classified Ty’s spinal injury as a “C6 incomplete.” Patients with this type are typically paralyzed in the legs, torso, and sometimes the hands as well. But because Ty’s injury was also “incomplete” there was a chance he could regain some of the feeling below the injury. At this point it was hard to tell. 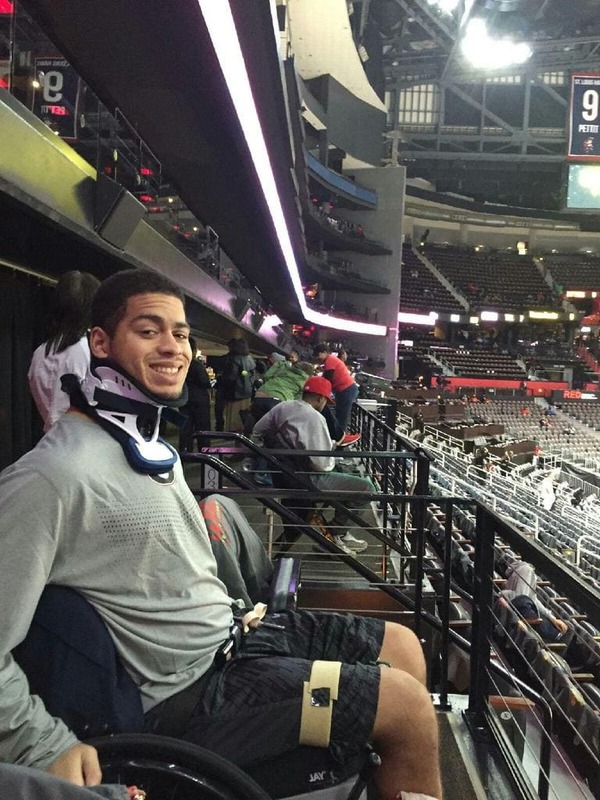 Ty is hardly the first player to be seriously injured during a football game. In fact, the sport has received quite a bit of criticism in recent years because some feel that it might be too dangerous of a sport. 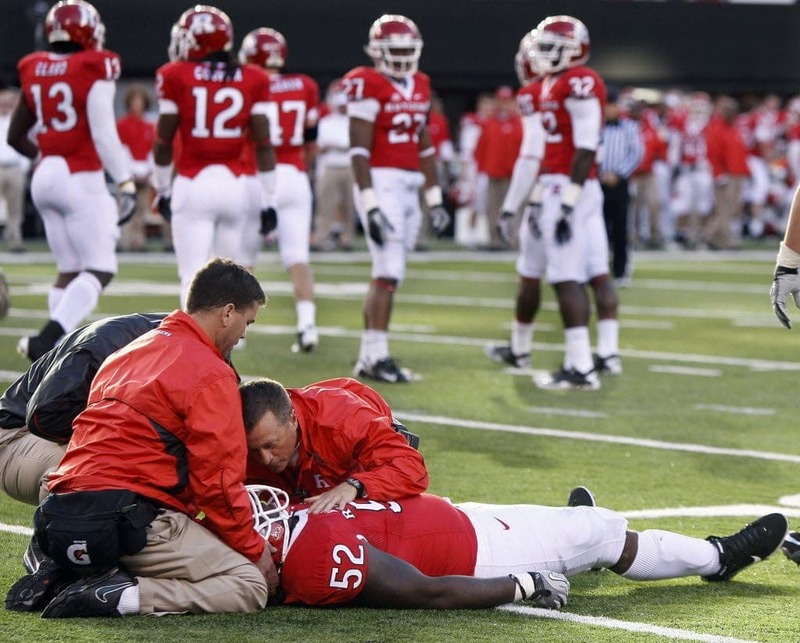 In addition to stories like Ty’s where a player can become paralyzed, players can also seriously injure their legs or arms. 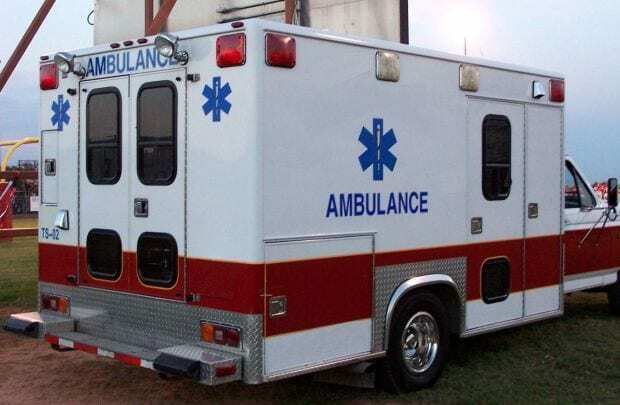 Additionally, there are serious concerns over the long term effects of concussions, an injury that plagues many football players across the board. But despite the dangers, people still love the game. In the blink of an eye everything had changed for Ty. He spent an initial two weeks in the hospital coming to terms with the fact that his football career was now over. His doctors warned him of the possibility that he might never regain the use of his legs, although it was also not something to rule out. Basically, he needed to wait and see. Ty explained that there was no way to guarantee that he would get better, and that he was esentially told that whatever can heal will heal whenever it decides to. Ty wanted to hope that he might get better, but he knew that the odds were stacked against him. The real question would be just how would the “incomplete” part of his spinal injury end up playing out. Many patients with a similar injury do in fact improve somewhat, but even with improvement many still remain unable to walk. About one out of eight patients with an incomplete spinal cord injury might be able to walk again. Ty just needed to be become that one. 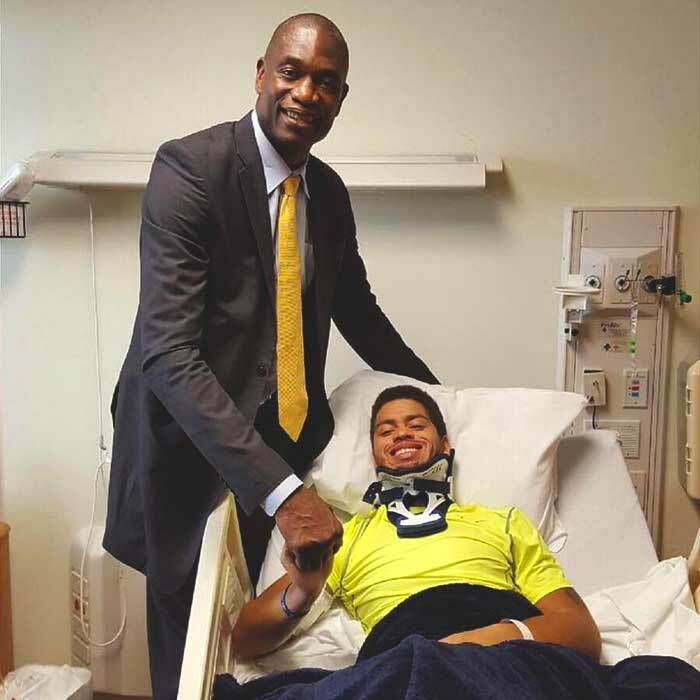 After his stay in the hospital Ty then began an intensive four months at a rehabilitation center, and afterwards continued with his rehab and physical therapy in the hopes that he might walk again. But his rehab wasn’t just about learning to walk, it was about learning to do all sorts of little things for him to lead a normal life. Things like getting in and out of bed, how to pull yourself into a wheelchair, and more. Ty seemed to have a long road to walking ahead of him. 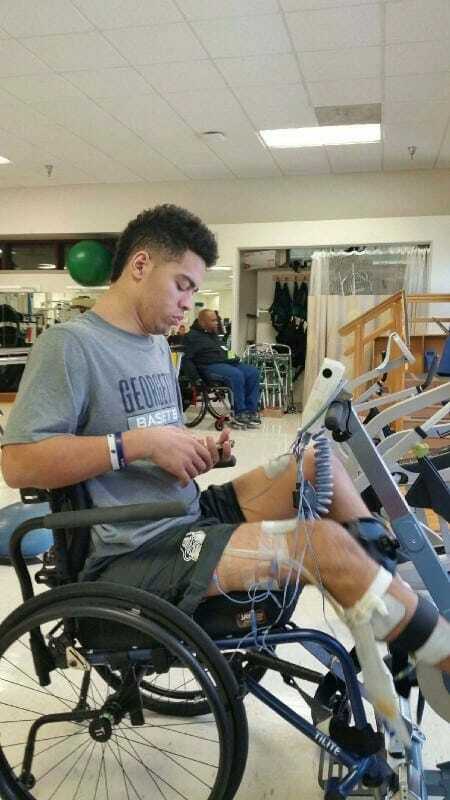 Although the road seemed long, Ty was determined not to give up on the dream of standing and walking again. He had many rough days where he almost gave up, but he refused to accept that his new situation was permanent. 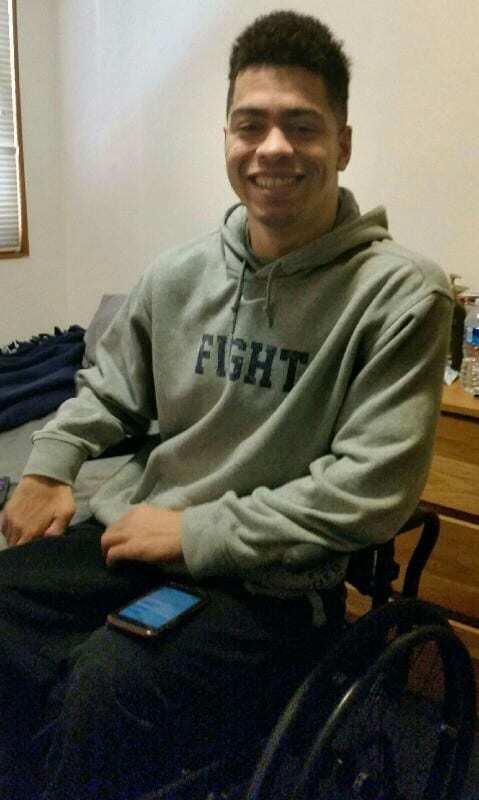 With that idea motivating him, Ty continuously persevered through treatment after treatment. He gave his physical therapy all he had, refusing to stop an exercise until a doctor would tell him to. And while he may not have been walking, he was able to start living his life again. Ty may not have been able to play football any longer, but he wasn’t going to let that keep him the team that he loved. Once he had recovered enough to return to school, he began attending all the football games and practices just like he used to. He offered his teammates motivation and advice throughout their games, and never failed to cheer them on. The team still considered Ty a member as well, even voting him team captain, and being sure to have him right on the field with the rest of them. 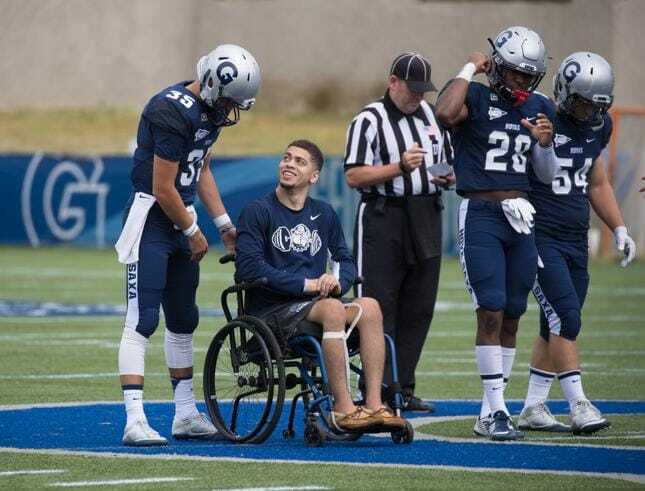 Ty’s injury, and his journey to recovery, was something that both his university and his hometown continued to follow closely. 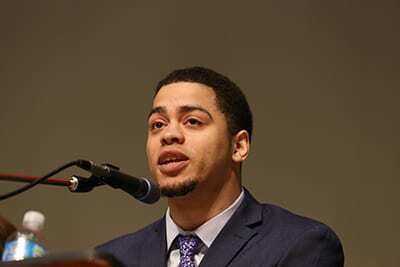 People were continuously inspired by Ty’s attitude and unbreakable spirit. In June 2017 his former high school, Quince Orchard High School, invited him to be the guest speaker at senior graduation ceremony. He used his experience to motivate the group of teenagers and encourage them to never give up on their goals, no matter what odds might stand in their way. Ty is a positive person himself, but even he had moments where he felt broken down and disheartened. He later said that besides his own personal drive to get better, he found himself motivated by those closest to him. 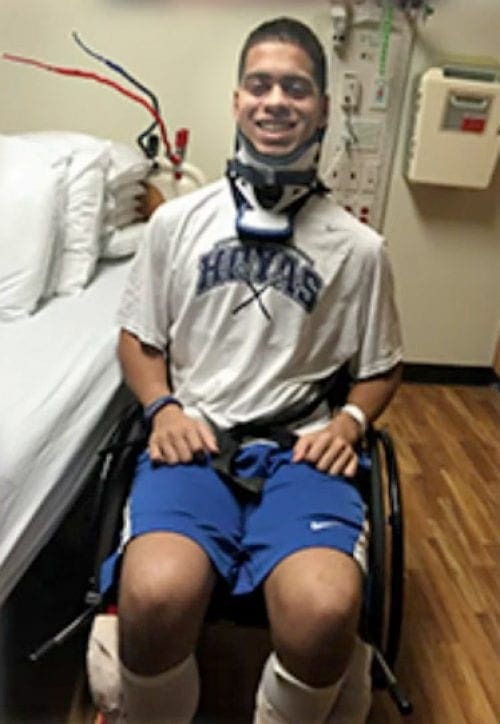 His friends, family, and teammates had all rallied around him, and encouraged him to never give up. 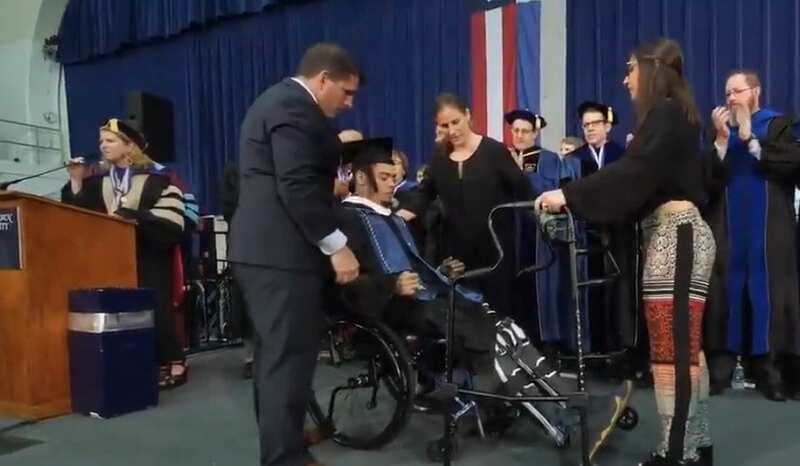 While many say that he is inspiring, Ty himself was inspired by others to finally walk at his graduation ceremony. Just goes to show how important positive influences in our lives can be. 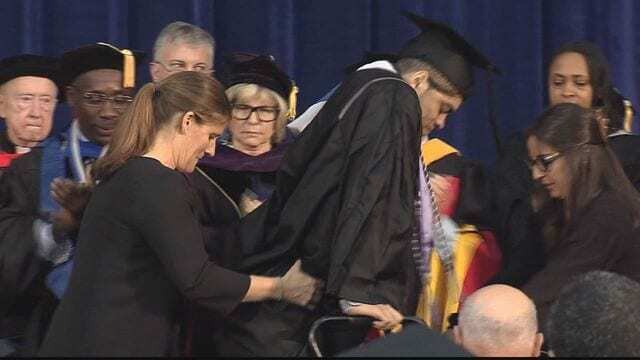 The journey to taking those first steps at his graduation had been a long one, and happened a few years after his initial injury. The first few months after his injury were probably the toughest, as there was so much that he had to relearn, but overtime he began to slowly improve. His first major accomplishment happened close to the one year anniversary of his accident when he finally stood upright for the first time, even though it still required help. From there he just kept moving forward. 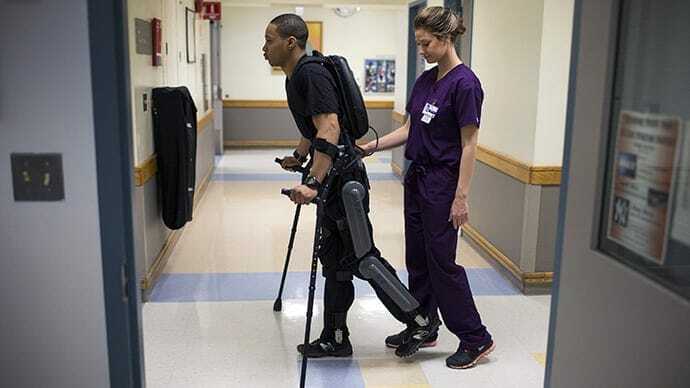 Ty’s physical therapy has encompassed all sorts of exercises and techniques, but what has really made a difference is his use of innovative exoskeleton. Robotic exoskeletons are part of the latest cutting edge technology out there that can help patients with spinal cord injuries walk again. It essentially helps move the patients muscles for them, which can then in turn help their bodies relearn how to walk. When Ty’s specialist recommended it to him, he didn’t hesitate to give it a try. Ty first caught the media’s attention because his injury was something that had been witnessed by so many. But they have continued to follow his progress and keep up with what he’s done. 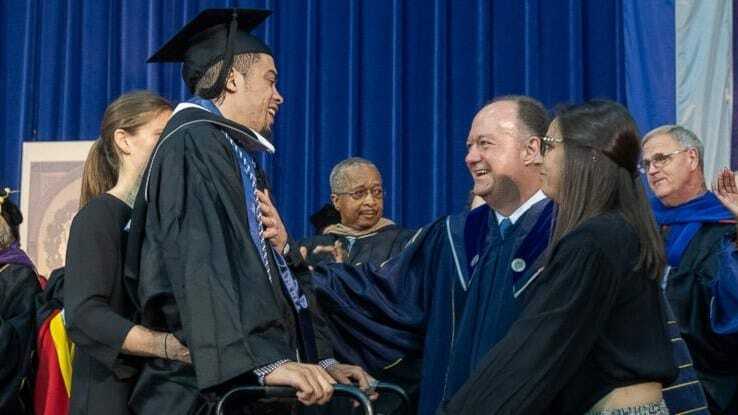 When Georgetown University shared the video of Ty walking at graduation people the story quickly went viral, receiving close to 700 shares from Twitter alone. Soon news outlets such as ABC and Fox quickly caught wind of it, and couldn’t wait to interview Ty and share his story with even more people. 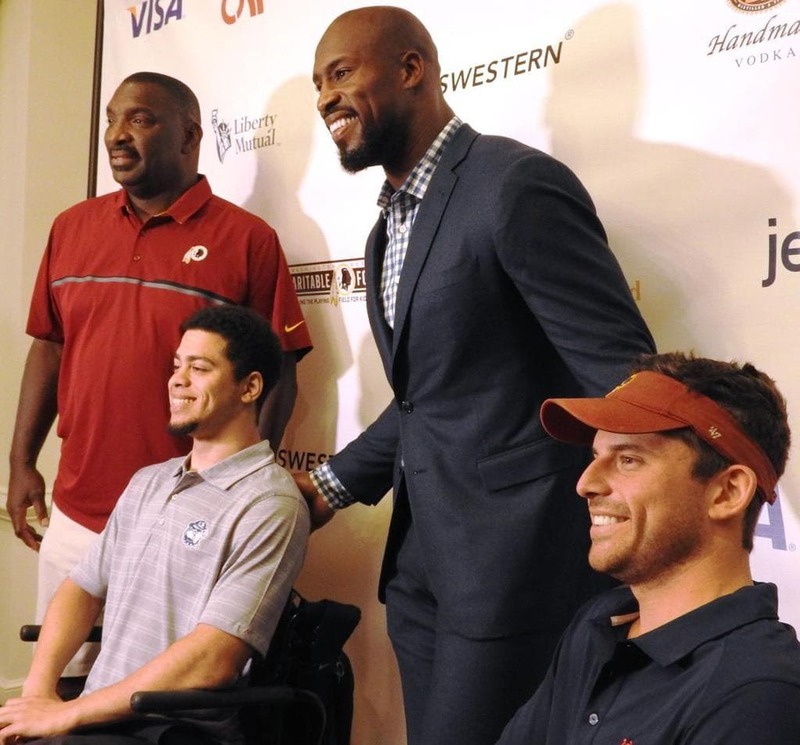 Ty’s story and his positivity have gone on to inspire so many people, even professional football players who were then inspired to donate to his cause. And it seems he can only go up from here. Ty’s victory in being able to take those few small steps could mean that there is hope for his future, and that one day he might be able to truly walk again. It also provides hope for others who might have a similar injury, and help to motivate them to keep trying and pushing forward.